At the moment there is a strange story in the news, about an alleged gorilla arm which was found on a beach in Kilkee, Ireland. You can read the original story here. The photo in the article shows the grisly-looking, nearly fully skeletonized remains of a very robust limb, with the bones still attached to each other by the remains of the ligaments and other tough soft tissue. When it was found, it was even assumed at first to come from a human, but was later „identified“ to belong to a very large primate, most likely a gorilla, but there are also speculations that it ss from a chimpanzee. I really wonder who made those analyse of the remains, as the alleged identification is simply plain wrong. First of all, if you walk on an Irish beach and find some bones, should you really assume in the first place that they belong to an animal native to the African continent? Why not, well, trying to look if there is any local animal which would better fit it, like, for example a marine mammal? We live in the times of the internet, and it was never easier to look for and find information and photos than today. But this capability is still usually never used by most people in such cases. It is just dead easy to google for „gorilla arm bones“ or „gorilla skeleton“ to make a comparison and see that it obviously does not belong to a gorilla or any other primate. What you see is not the arm of an ape, but the hind flipper of a seal. The two long bones are not an ulna and radius, but a fibula and tibia. If you take a close look at the original photo, you can also see that they are also close-knit at the base. The four long „fingers“ are also just the long toe bones of the seal flipper, with the fifth one already lost. 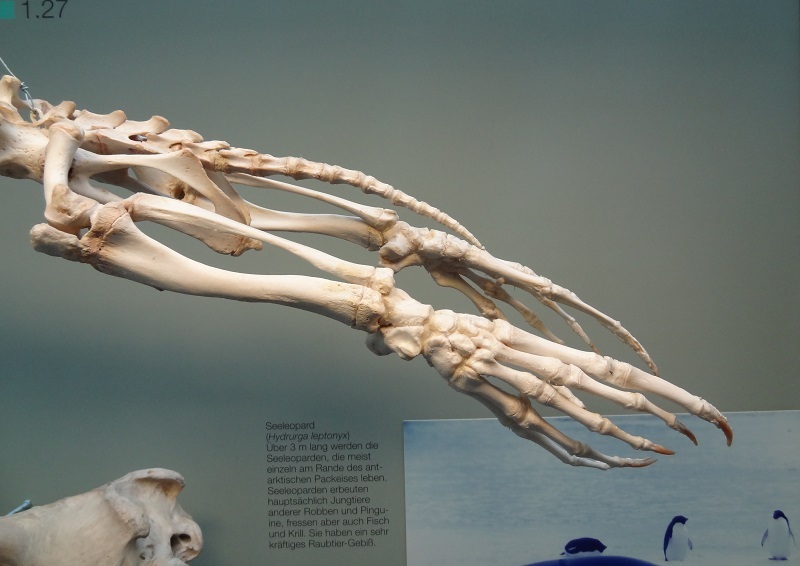 Harbour seal hind limb bones, Staatliches Museum für Naturkunde Stuttgart. The ceratinous sheats of the claws at the proximal bones are already lost on the „gorilla arm“, but you can see them still on the photo above. 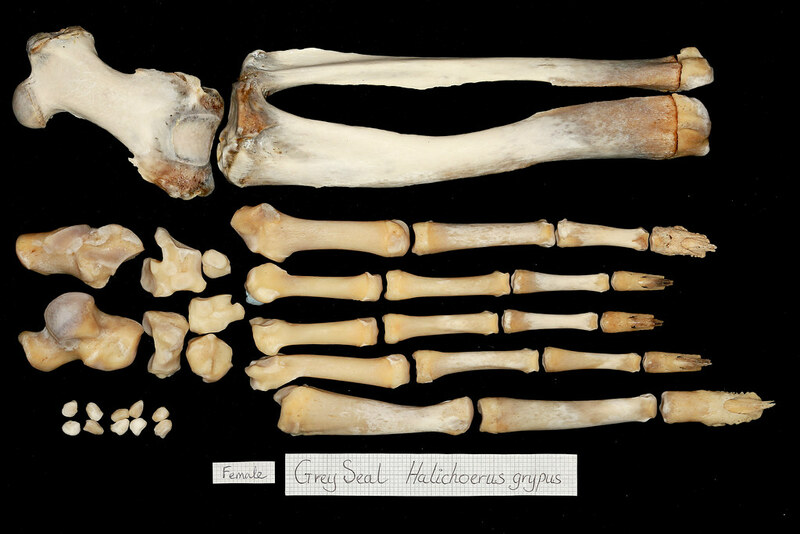 You can also see a very good photo of a disarticulated hind flipper of a grey seal (Halichoerus grypus), which shows all the isolated bones here. Seals have toe and finger bones which are comparably circular in cross-section, whereas gorillas have extremely gnarly bones for the attachment of massive tendons. 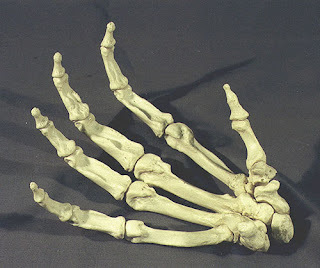 The lengths and proportions of the different phalanges are also quite different from those of a seal, where the first and fifth toe are longer and thicker than the ones in the middle to form a shape similar to rubber flippers. The bones from Kilkee belongs most likely either to a harbour seal or a grey seal, as both species are native to the waters off Ireland and could both fit the size of the remains. So no more mystery about a gorilla arm on a beach, just another case which shows how easily people are tricked by the differences between the external shape of an animal and the shape of the underlying bones. Dieser Beitrag wurde unter Anatomie, Populäre Irrtümer, Säugetiere veröffentlicht. Setze ein Lesezeichen auf den Permalink. why would a dog warden who clearly knows local vet, not just have the vet look at it??? seals use that beach to bread?? hes seen a seal before. Good question. But it´s a very common phenomen that people just look at the overall shape of an animal carcass (or in that case, parts of it) and don´t think about the fact that decomposition could have changed its appearance a lot. In that case somebody has only seen a large robust arm with long „finger“ bones, what was enough to let people assume it was from a primate.